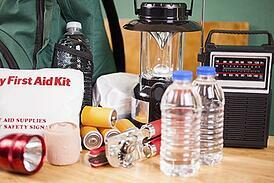 Have you been telling yourself you need to put together an emergency kit "someday?" Emergencies have no respect for time or place, so don't risk your safety by being unprepared. Here are some guidelines to help you assemble a kit that will see you through almost any type of an emergency. A self-powered radio with a flashlight and cell phone charger covers several needs in one. If you go with separate pieces, make sure you get a battery-powered radio and include an extra supply of batteries for both the radio and flashlight. It's also a good idea to have a whistle that can be used to signal for help and let others know your location. You should plan on one full change of clothing per person. If you live in a cold weather area, include jackets, hats, gloves and blankets along with sleeping bags. Rain can strike any time of the year, so pack rain gear and a tarp or plastic sheeting that can serve as temporary shelter. If you have a pet, it should be included in your preparations. Along with safety supplies, you will want to have items to keep your pet calm and comfortable. An Evacsak makes a cozy spot for your dog or cat. It comes with a waterproof envelope for storing copies of vaccination records and other information. If you don't have an Evacsak, a pillowcase will work as a substitute. Talk to your vet about a pet first-aid kit, or use ASPCA recommendations to assemble your own. Pack up to a week's worth of food and include your pet in your calculations for water. Aluminum roasting pans are handy for makeshift litter boxes. Include kitty litter along with garbage bags, paper towels and disinfectant for sanitation. Have a few toys on hand to keep your pet occupied. In the event you and your pet should become separated, current photos can help with a search. Our residents' safety at all times is a priority for our Springs Apartments on-site management teams. Stop in the office or call with any questions you may have about emergency procedures and other safety measures.